Spring at the Bog of Allen has officially arrived. The Irish Peatland Conservation Council (IPCC) is welcoming its somewhat delayed onset for 2013. After a long winter with temperatures hitting record lows in March, wildlife is beginning to make a welcome return and each day IPCC are finding more and more evidence for this at the Bog of Allen Nature Centre and their two peatland reserves in Lullymore, Co. Kildare. “It started out with our garden ponds filled with croaking frogs, and as temperatures increase we are now looking at water brimming with tadpoles and pond life that is starting to thrive. Our reserves too are showing the signs of spring with our three resident curlew returning to Lodge Bog and the endangered Marsh Fritillary butterfly being found in abundance on Lullymore West Bog” says Tadhg Ó Corcora, Conservation Officer with the IPCC. The rarity of native curlew in Ireland means that these three individuals may prove very important to the future national population. Last year the IPCC carried out a detailed survey on these birds and found that breeding had occurred though unfortunately the nest was subject to predation. It is hoped that 2013 may bring more success. The group is thrilled with the Marsh Fritillary numbers where this week six nests of caterpillars were found on the Lullymore West Bog site, with further searches to be carried out over the coming days. 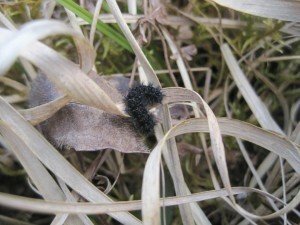 “There were fears for the Marsh Fritillary as it has been over-wintering as a caterpillar buried in the cold ground since September. If they awoke too early we were concerned that there would not be sufficient food available after their long hibernation. However in only one hour of searching we found 6 healthy nests and this matches the numbers found last autumn before hibernation so we are thrilled. To top off the day I saw my first two swallows of 2013 flying over the site so it seems that spring has finally arrived.” Mr. Ó Corcora continued. This entry was posted in News and tagged Activities, Bogs, Frogs, Things to Do. Bookmark the permalink.